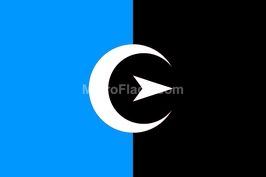 The Flag of the Moon, designed by J. Alfary, represents humanity's goal of Moon settlements and the Moon itself. Blue stands for the Earth, humanity, hope, water, and life. The blue and white represent the unity and interrelationship between the Earth and the Moon. Black stands for the darkness of space surrounding the Moon and the sacrifices that humanity has and will overcome to reach and settle the Moon. The inner black circle represents an eclipse. The white waning crescent represents our Moon with the white arrow pointing outward indicating that the Moon will become humanity's first base in the exploration and settlement of other worlds.